The Queensland Government strongly supports infrastructure investment in North Queensland, and is working closely with the Commonwealth Government to facilitate the Northern Australia Infrastructure Facility (NAIF) in North Queensland. North Queensland is well placed to deliver economic growth and job opportunities for both Queensland and Australia through infrastructure investment. The Queensland Government is working every day to promote investment in North Queensland, and continues to allocate significant funding to support the development of new infrastructure. 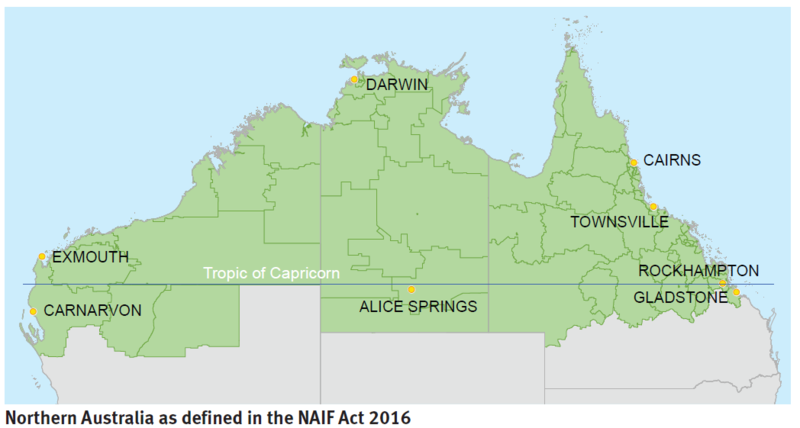 For the purposes of the NAIF, Northern Australia includes all of the Northern Territory, and those parts of Queensland and Western Australia above and directly below or intersecting the Tropic of Capricorn. The NAIF is a Commonwealth Government initiative offering up to $5 billion in concessional finance to encourage and complement private sector investment that benefits Northern Australia. The NAIF will support investment to construct or expand economic infrastructure, including but not limited to airports, communications networks, energy, ports, rail, water, social infrastructure (including health facilities, education facilities, research facilities, training and related accommodation facilities) and processing facilities. The NAIF primarily offers concessional loans, which must be capable of being paid back to the Commonwealth or refinanced. Loans can be tailored to each project, including flexible loan terms or extended repayment periods. NAIF can lend up to 100% of the debt to a project, but must ensure appropriate risk sharing. Formal criteria for investment are outlined in the NAIF Investment Mandate. Importantly, this Commonwealth initiative can complement existing Queensland Government investment programs. The following Queensland local government areas (LGAs), and all LGAs located to the north, are located in the region defined by the NAIF: Diamantina Shire Council, Barcoo Shire Council, Longreach Regional Council, Blackall-Tambo Regional Council, Central Highlands Regional Council, Rockhampton Regional Council and Gladstone Regional Council. Applicants for financial assistance apply directly to the NAIF (contact details below) and are encouraged to make initial contact to discuss their project. Applications are assessed by an independent NAIF Board under the Investment Mandate, set by the Commonwealth Government. The Board will consult with the Queensland Government on sufficiently developed business proposals to align with state priorities, as soon as practical after receiving an application. Interested project proponents who believe that their project might satisfy the eligibility criteria for NAIF set out in the Investment Mandate may make an expression of interest at any time by contacting naif@naif.gov.au or 1300 GO NAIF (1300 466 243). General enquiries for Queensland NAIF projects, proponents and relevant officers may also be directed to the Qld NAIF Secretariat on 0429 516 861. The headquarters for the NAIF is located at Level 7, 46-48 Sheridan Street, Cairns.